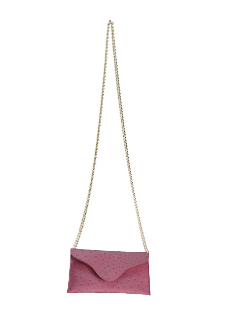 JJ Winters #257 Pink Ostrich Leather Chain Strap bag. Made from leather with ostrich skin embossed detailing and a Silver Chain. About 5 inches high, 8 inches long, and 2 1/2 inches deep. 44 inch chain 21 1/2 inch drop length. The chain stows inside bag so that it can be used as a hand held envelope clutch. This adorable JJ Winters Chain Strap bag can be special custom ordered in any color Ostrich Leather JJ Winters makes with a Gold or Silver colored chain strap. Please allow approximately 3 weeks for custom special orders. Contact us for colors and details. Special Order please allow 3 to 4 weeks for delivery.